The Minister of Defence, Mansur Dan-Ali, made this known while answering questions from State House correspondents after a closed-door meeting with the Acting President, Prof. Yemi Osinbajo in the Presidential Villa, Abuja, on Thursday. He said the meeting was also attended by Gen. Gabriel Olonisakin, the Chief of Defence Staff (CDS); Lt.-Gen. Tukur Buratai, the Chief of Army Staff (COAS), Vice Admiral Ekwe Ite-Ibas, Chief of Naval Staff (CNS), and Air Vice Marshal Sadiq Abubakar, the Chief of Air Staff (CAS). 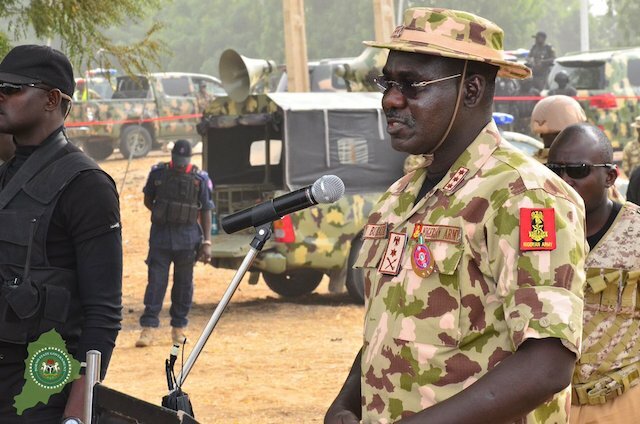 According to the minister, the meeting agreed to get more surveillance devices, cameras and other vital security gadgets that will be able to see distant attackers coming to the position of the Nigerian troops. “We just finished a meeting with the Acting President and the three Service Chiefs. “We agreed that they should move back to the Command Centre again and see what are the things happening there. “The period of the raining season is a difficult moment for us. “We cannot dominate the environment like what we do during the dry season but effort is geared towards regaining back our areas,’’ he added. The News Agency of Nigeria (NAN) reports that suspected members of the Boko Haram sect have intensified their deadly activities in Borno in recent times. Th suspected insurgents on Tuesday attacked a convoy of oil workers at a village along Gubio and Magumeri local government areas. The attackers ambushed the oil workers, who were staff of the Nigerian National Petroleum Corporation (NNPC), travelling in a convoy of about 10 vehicles.